In light of the disturbing events on the other side of the planet this past weekend, I am reminded of the need to get the word out about the love of God for a hurting world. I am reminded that some people pay a much higher price than I do in serving Jesus. And I am reminded of how little I feel I do for Him so many times. There are people who don’t have even one page of Scripture in their own language, let alone have a copy of it for themselves. Yet I have multiple hardcopy versions, not to mention the electronic versions I have access to day and night. And my kids even have multiple copies of the Bible in formats they can relate to and understand. There are people who have to go to church in secret… or who get attacked if they attend openly. Yet I have multiple churches to choose from and can attend in freedom the one which I feel best suits my needs and the needs of my family. There are people who will be disowned from their families if they convert to Christianity and lose their business if they share Jesus with someone. Yet I am a third generation minister whose grandparents served the Lord faithfully and prayed for each successive generation in our family to know Christ and make Him known. And I have the privilege of watching their prayers come true as my sons follow Christ as their Savior. But sometimes, it can feel as if we are not doing as much as others for the cause of Christ. Please don’t misunderstand… I’m not trying to make an allowance or an excuse for anyone not doing all they can for the Lord… I’m simply stating that there are some who seem to do so much and pay such a high price for it that it seems at times as if what I do pales in comparison. Maybe you’ve sensed that at times, too. Faithfulness isn’t glamorous, but it is valid. I read in my time alone with the Lord recently in Philippians 2:17 where the Apostle Paul… whom I would say had some really significant accomplishments and suffered a really significant amount for those accomplishments… told the believers in Philippi to just keep being faithful where they were… doing what God had asked them to do. Then he says that just like his extreme suffering as a result of his extreme efforts for the Kingdom were an offering to God, their faithful service to God in an easier setting was also an offering to God. Isn’t that encouraging? Just because you don’t seem to “match up” to others in serving the Lord according to our own human understanding doesn’t mean that you are not making just as big of a difference in God’s eyes. Some people “blow in, blow up and blow out” in serving God, and we ooh and ahh. Others stay steady at it, day in and day out… week in and week out… month in and month out… year in and year out… decade in and decade out… and we overlook them. 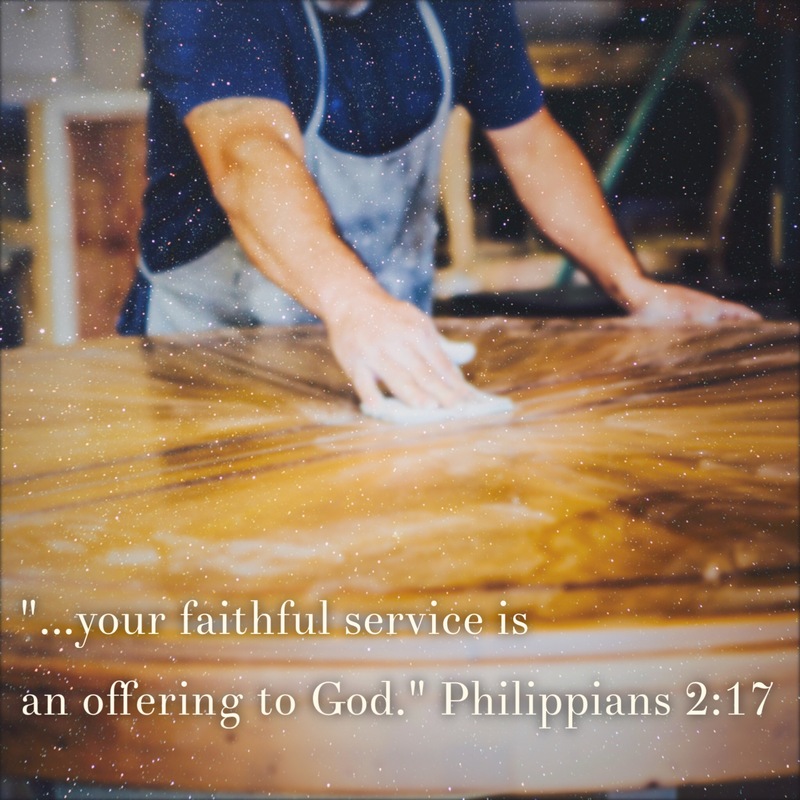 But Paul says that this faithful service is just as much an offering as those who are suffering for their faith. Let me also say that I am in no way belittling the price that so many pay for our faith. They are inspiring and challenging to me and my desire to accomplish all I can for Christ while I live on this planet. They are heroic. And so are some of you… you faithful ones who just don’t give up… who just don’t stop loving and serving. So, in the end, what each of us who believes in Christ needs to do is simply obey and give of ourselves. Give of ourselves if it is something massive and challenging. Give of ourselves if it seems mundane and monotonous. Either way, we are giving God an offering that broadens the smile on His face. And that is what I want to do. How about you?